Way back in 1994, a Blue Ribbon Committee of the National Association of Corporate Directors urged the boards of all public companies to establish a formal system for annually reviewing the performance of their CEOs, the boards themselves and, in time, all the individual directors. This was considered an integral part of an effective corporate governance program. The last Korn/Ferry directors' survey reported that 64 percent of all companies contended that they did have a formal program for evaluating their CEOs, but of those, only 40 percent said they evaluated their own boards-and only a smattering regularly measured the performance of individual directors. Now, I can somewhat understand why one-third of America's corporations are unwilling to have-or say that they have-a formal program for evaluating CEO performance. We still have a lot of boards that are dominated by their CEOs, who say, "I get my performance measured every quarter by our financial results. We don't need anything more." Some companies and boards do a good job of working with their CEO. And we also have a number of drowsy companies who just haven't gotten around to doing anything about improving their corporate governance programs yet. But to have 60 percent of our companies report that they do not review their own board's performance each year is worrisome. And there's reason to believe that those who said they did review their boards, didn't do a very thorough job of it. So, let's kick it around a little and try to see if we can find out what's holding us back. To begin with, what are we talking about? A board review such as this is not a big time consumer, it does not require hiring a consultant, nor does it hurt anybody's feelings. It simply consists of asking the board to rate itself on how well it performs its various functions and suggesting what needs to be done to improve things. It can be accomplished with a short questionnaire-signed or unsigned. One outside director, usually the chairman of the corporate governance committee, if there is one, needs to consolidate the responses and lead the ensuing discussion. The questions can be fairly routine: the quality and timeliness of the board material furnished in advance and at the board meeting, a review of agenda items, the depth of discussion of major projects, participation in strategic planning, the functioning of all board committees, how well the CEO's performance review was done, the follow-through on meetings of independent directors without the CEO present, etc. Companies that seem to be progressing well can use a standard list of questions each year. Companies with apparent problems may wish to focus on the sore points. If I were the CEO of a company whose board conducted a full-scale, formal review of my performance each year, I think I would be the leading proponent of seeing that the board also measured its own performance. And I'd like to also see it gradually move on to measure the performance of individual directors. If I were being approached to become an outside director of a company today, one of the critical questions I would ask is, "Does the board have a formal appraisal of its own performance-and can you tell me about the last review?" If I were the director of a company that has fallen on difficult times and fingers were beginning to be pointed at everyone, I think it would be prudent to recommend appraising the performance of the board as well as all other sectors of the company. If I were a reporter, writing a story about a company that had just dismissed its CEO for inadequate performance, I would be inclined to ask if the board had considered its own performance as well. The boardroom is one of the last, best bastions of the free-enterprise system in this country. But these days, when stock prices fall and shareholders are unhappy and when we have a number of company failures around, questions are being asked about the effectiveness of our corporate governance. It just makes good sense to keep our self-improvement programs moving and up to date. Formerly CEO of F.&M. 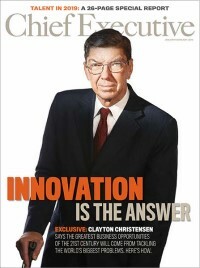 Schaefer (1972- 1977), Robert W. Lear is chairman of CE's advisory board. He taught at Columbia Business School, where he was executive-in-residence until June 1999. He has been a director of many companies and is on the advisory boards of five small firms. He is a partner of Lear, Yavitz and Associates corporate governance consultants. Let's pretend that you've been selected to be the CEO of a new, multi-billion dollar spin-off from a respected corporation. One of the first things to be done is to form a board of directors. You have hired me to be your advisor. How do we go about forming the perfect board? First, I would hope that you would be chairman and an active participant in the recruiting of directors. I hope you have had experience as an inside board member and at least one outside board. If not, I've got some reading for you to do. We'll plan on having a nine-person board. That is large enough to cover the talents we need and small enough to indulge in vigorous discussion of our key issues. Next I would look for a seasoned operating executive with experience relative to our company's functional structure. If this executive is a "people person" with some HR exposure, so much the better. Sixth, I want to add a market-oriented director who can help shape the company's policy towards more effective global distribution, market and product development, and customer service. Is our job done? Hardly. We have not yet considered several significant criteria in board composition. We need to have age dispersion so that too many directors don't retire at the same time. We need to diversify with women and minorities that bring re-freshing viewpoints. We need a blend of global experiences. A variety of personalities is desirable. As we discuss and interview candidates, it's vital to keep diversification in mind, for it's a serious consideration. Nevertheless, it's well worth trying-and ceaselessly re-trying-to achieve the near perfect board for your company. It costs no more than does a slap-dash board and, oh, what a difference it makes!